Advertising sales is the life blood of media companies. Learn to be good at it or fall behind. Approximately a million executives are engaged in selling advertising in the United States today. For magazines and newspapers, online publishers and networks, TV, Cable and radio stations, outdoor, mobile, event programs and sponsorships, placed-based media in malls, offices even elevators, medical offices, sports venues, transit, and on and on, sales people are competing with each other to win the dollars that make their media successful. Advertisers have more choices every year. To break through and to stand out in the forest of choices that advertisers see requires greater sales-person-ship than ever before. Ambro.com is dedicated to helping you and your company compete and to win in this ocean of opportunity. In short, advertising sales demands superior salesmanship. Greater sales skills will make more and bigger sales. And a media company that understands and executes the sales and marketing of advertising with excellence will gain sales and market share over time, growing nearly without limits. Sales skills are not innate. They are learned. Some sales people do seem more ‘natural’ than others, but even they get better with experience and with learning. Our mission is to help you improve your own sales skills and help you teach sales skills to your staff. 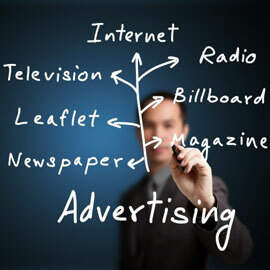 Advertising sales is different than selling other big-ticket business-to-business products and services. At ambro.com we believe you can learn from other ideas about selling, but adapting those skills and practices to selling advertising doesn’t come naturally for all. We aim to do it for you by pulling together the best practices and the best thinking about sales today and integrating them into our sales training. Advertising is a public business decision. Besides the public being exposed to the advertising creative, your client’s choice of where to advertise is public, too. Everybody thinks they know about advertising and feels free to comment upon it. So the ‘decision maker’ will be subject to comments from his or her business colleagues and even friends and relatives about the advertising creative or media choices. All your competitors can see that you have won the account. Frequently, immediately upon publication, or airing of your sold advertising, your competitors will call your customer seeking to switch them. Advertisers may even be subject to bad publicity, or boycott, if they choose to advertise in certain media segments that the public find offensive. Advertisers are like sheep. Strangely enough, most advertisers tend to follow their competitors. To some degree this makes sense because the competitors are trying to advertise where the customers are. But getting a competitive advantage from your advertising would seem to require doing it differently than your competitors. Advertising agencies and media buying services complicate matters. No other large important business-to-business sale must be made through third parties that are paid to filter opportunities and to make recommendations, but incentivized to minimize the amount of time they spend doing so. Advertising is creative. Advertisers purchase media for many different reasons… advertisers may appear to be buying an ad in People to ‘reach women 18 to 34,’ but they are really doing it so they can tell their sales force about it and get them charged up to call on retailers. In the same issue, there may be an advertiser whose primary purpose is to keep an important dealer happy. In the same issue of a newspaper, advertisers might be trying to generate awareness, drive store traffic or increase purchase intent. Despite the fact that the measurement of advertising and advertising effectiveness is a multi-billion dollar business, advertisers are not really sure if their advertising was well spent. 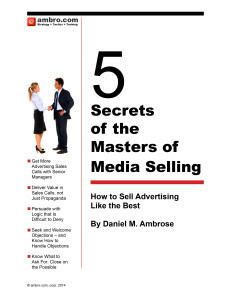 Our mission at ambro.com is to help you develop your advertising sales, marketing, strategy, tactics and training to achieve the excellence that will be an ongoing competitive advantage.